Today, a projector is an imperative tool in multimedia presentations. They are used by teachers to aid in lessons, corporations during training seminars, in houses of worship and countless other arenas. Choosing the right data or digital projector is important in making multimedia work for you. No matter what your need is, Camcor has the right projector for you. What Do You Wish to Do With the Projector? The next question that you must ask yourself when choosing the right projector is what you are planning on doing with the projector. Once you have answered the questions above, you can begin looking at the features below that are essential in choosing the right projector for you. A lumen is a measure of light. The more lumens the brighter the projector. High lumens allow you to overcome ambient light and project images at longer distances. 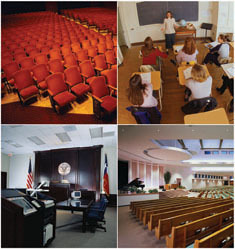 A projector that is used in a small, dark room would not be suitable in a large, well-lit auditorium. There are two levels of resolution available on most data projectors SVGA and XGA. XGA is higher and shows greater detail than SVGA . For basic PowerPoint and text projections, SVGA is suitable; however, for movies, image-intensive PowerPoint presentation, interactive websites or Excel spreadsheets, XGA is recommended. When choosing the right data projector, one question you need to ask is what size you need and will it be stationary or portable. Some portable data projectors typically have a footprint around the size of a sheet of notebook paper and weigh as little as 4 pounds. Connections: Make sure that the projector you choose will allow you to connect to the media you wish to use. 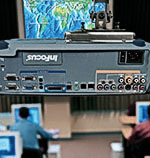 Some projectors offer multiple VGA connections, which allow you to project your computer’s image while still using your local monitor. This feature is called a monitor loop through. If you wish to use a remote diagnostic monitoring system to track usage, temperature read-outs and more, you should look for a network connection (RJ-45). With the increase in emphasis on high definition, an increasing number of projections are now coming with digital video connections allowing even more options of inputs.